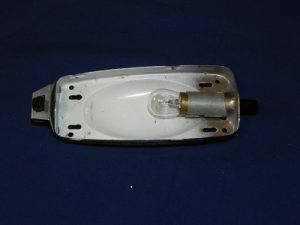 A Complete Dome Lamp Reflector. This dome light reflector I have listed here is used. It is rare to find these dome light reflectors excellent like the one in the picture. So I buy used ones, clean then, wire brush them, sometimes paint them, dismantle the switch and restore the switch to working order. Please understand what you are buying is used reflector that have been renewed and made to work again. This pictures shows what they should look like and I do my best to renew then as close as I can. 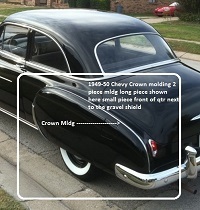 Used in Chevys from 1949-54 in the 2dr sedan, 4dr sedan and the wagon. Also used on Pontiac and Oldsmobile cars in those years.